FORT LAUDERDALE, Fla. (AP) — It’s one thing when hotels open fitness centers, but quite another when fitness centers open hotels. Most hotels have beefed up fitness options — you can book rooms with stationary bikes and rent workout clothes — but wellness travel has become much more than just keeping fit while on the road. Increasingly it’s become the point of the journey. And it’s bringing in big dollars. “We are seeing (cruise) lines of every ilk and size embrace healthy eating, fitness, all sorts of positive, new kinds of approaches to yoga and that kind of thing,” said CruiseCritic editor at large Carolyn Spencer Brown. Savvy athleisure retailers are also seizing on it. Lululemon and Free People, a bohemian line popular with yogis, have both branched into wellness tourism. Free People’s retreats started a few years ago where participants can exercise and try journaling or tarot card workshop in spots like Glacier National Park. Zen travelers are shelling out thousands to follow celebrity trainers to exotic destinations. Tracy Anderson, who is Gwyneth Paltrow’s business partner and the trainer who shapes Jennifer Lopez’s famous booty, hosts a handful of intimate weekends each year with less than 40 guests. Participants sweat alongside the fitness guru and get to know her during fireside-style chats in cities including Miami and Aspen. The weekends, priced at several thousand dollars, always sell out. Shakira’s trainer Anna Kaiser leads a few trips a year, including recent stints in Ojai and Austin. And retreats for the hot workout du jour The Class by Taryn Toomey have all sold out, often within one hour. Toomey’s guests pay between $2,000 and $6,000 for her cathartic workouts with options for beachside massages and picturesque hikes in spots like Mustique and Mexico. 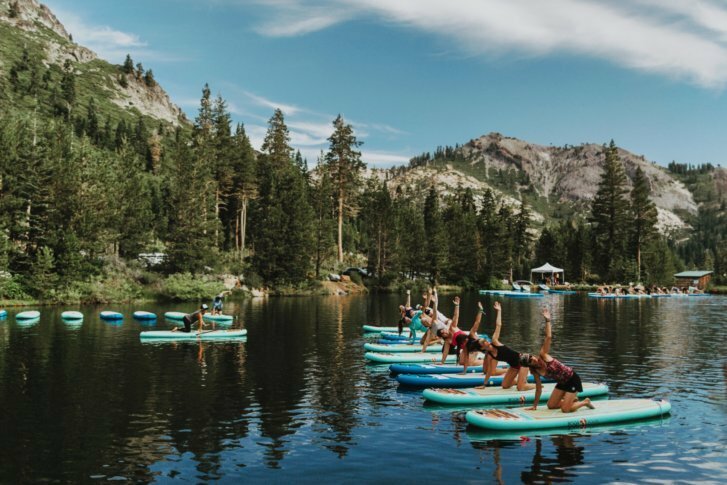 Roughly 100,000 wellness lovers attended uber-popular Wanderlust festivals across North America last year, partaking in everything from yoga and meditation to stand-up paddleboarding and spinning in spots like Oahu, Hawaii, and Squaw Valley, California. Meghan Aftosmis loved Wanderlust’s Vermont event so much last year that she’s heading back in a few weeks. The 39-year-old public relations exec from Delaware says she was eager to take yoga classes with one of the celebrity teachers. She also took a poetry session with a teacher she’d been following online. “It comes down to having an experience and especially in the summer I look for new adventures,” she said.